This device was born out of pure serendipity. One day I was dealing with wrist pain, from a fall two years prior. I went into my workshop planning to make something for my wrist, having studied the work of Slim Spurling, I decided to apply his principles for making active devices, and sat down to make myself a bracelet. When I went to choose a length of wire I thought of using the Sacred Cubit, but I distinctly heard in my head “use the Lost Cubit”. “What could it hurt?” I thought. The day I wore it to work, my wrist felt better, but as the day progressed I realized I hadn’t worried or obsessed about anything at all, it was like sitting at the beach, a restful mental vacation. When I got home I realized that Mr. Spurling explained that whereas the Sacred Cubit effects changes in the manifested world, the Lost Cubit works on the mental plane; so I figured the bracelet changed the spin of thought energy into positive spin. Next came experiments with other people, I would ask a subject to put it on and then I would instruct them to retrieve a really negative memory or a really negative thought; something that they know that when they think of it, they can feel the negative impact of it. After several more responses like these, I knew it worked. Using the second bracelet, for transmuting fear, proved to be as liberating as the first one was with thoughts. In the past, when I have felt intense fear, I always feel the impact at my solar plexus, and the experience of it will bother me the whole day. While wearing it one day, a co-worker had a hostile reaction to a question I had about a part I was processing; instantly I felt a twinge of fear in my solar plexus that dissipated as quickly as it came. Five minutes later I had totally forgotten about the experience and proceeded to focus on other things. My experience with these is that they are like training wheels; they help to wean a person away from these forms of negative energy. It is my experience and those of others that, after using them for a while, their effect remains even if not worn at all. 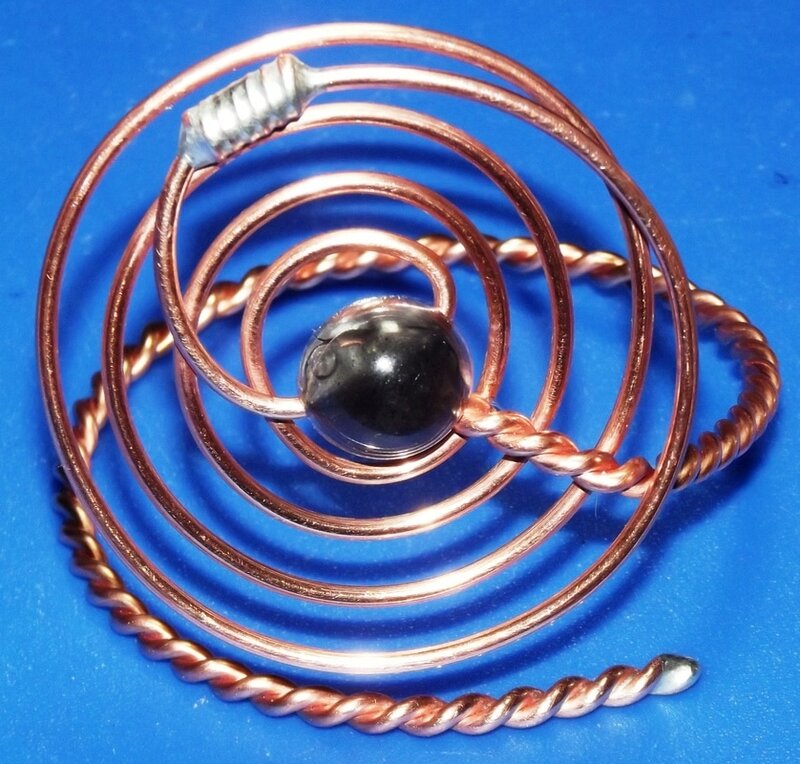 The main body of the bracelet is made of bare copper #12 wire, soldered with silver. I received your bracelet today and using my pendulum added an amethyst stone. Wow is all I can say after wearing it about 8 hours. I had a few situations today that would normally give me fear in my solar plexus or tension in my neck. Nothing but calm is what I experienced in those situations. I believe I shall program the bracelet to help with opening my third eye and crown. Amazing is an understatement on your device.